Clever and flexibly combinable – that is Link-It by Schneider Schreibgeräte. The patented click system integrated into the end of the pen allows two differently coloured fineliners to be attached to each other and this special feature secured the writing instrument a Promotional Gift Award 2018 in the category Communicative Products. As a two-part “team player” the pen with a rubber and ergonomically-shaped triangular barrel can among others be ideally implemented to promote company mergers. 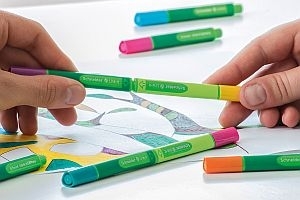 In addition to the flexible application – on its own or two colours in one pen – the models in the practical folding box additionally excel because of their sustainable production: According to company accounts, Link-It is the first fineliner on the market that is made out of bio-based plastic to 88%, the pen box is produced from waste from the internal plastic processing. The pens are produced by an EMAS-certified traditional manufacturer in an energy-efficient process; green energy is used and waste and emissions are reduced to a minimum.